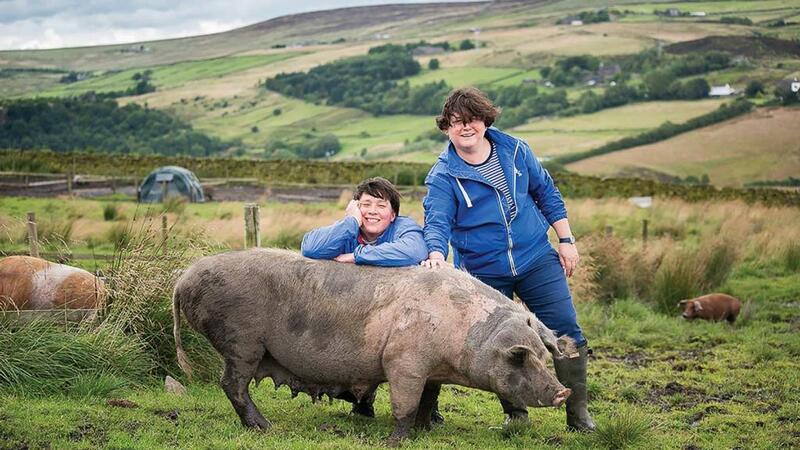 A commitment to achieve the best tasting pigs has fuelled the growth of a new venture for one West Yorkshire couple. Farming with simplicity and sincerity makes for a powerful combination and it is paying dividends for the couple behind Porcus Pigs. SJ and Nat Clegg are first generation farmers who left city life to pursue a shared dream to farm and produce some of the foods they love best through a field to fork operation. “Home-reared bacon on freshly-baked bread, spread with butter and a bit of sauce – I mean, seriously, it doesn’t get better than that does it?,” says SJ, placing the dish on the table to taste. The bacon is part of the pork portfolio, which also includes six flavours of sausages and a range of artisan charcuterie. Located in isolation on the Pennine Moors, overlooking the village of Todmorden, West Yorkshire, it is a far cry from the London life they lived for eight years. “It’s a different world,” she adds. “We really lived the life in London. I was working as an architect, Nat was a vet and we lived and breathed the food scene. With a mutual appreciation of good food, the couple spent hours talking about their shared dream to farm and produce their own food. Nat, who originally hails from the Ukraine, had grown up with an appreciation of self-sufficiency following the county’s political battles. SJ says: “Farming had always been a dream since I was a child. I have always loved growing things and the science involved within that and when I was younger I helped a neighbouring dairy farm. The couple researched the market to try and find a niche. A willingness to experiment has been key to their progression and remains an integral part of what they do. They began with two Large White weaners bought from a local farmer, which they went on to finish. They did not attend any courses and instead preferred to facilitate their learning through endless amounts of books. “We are both from academic backgrounds so reading was our way of finding our feet,” says SJ. “We gradually learned more and more. “Our first few attempts at making sausages were tasty but the consistency wasn’t quite right or sometimes they could be quite dry so we just kept on tweaking. “We also spoke to many people about the production process and although everybody had an opinion, we were conscious not to be too influenced by what others had seen in products before and who didn’t really advocate change. With her creative background, SJ was able to establish the branding and design for Porcus, which is Latin for pigs. “Making noise is important, sometimes he who shouts the loudest gets heard the fastest. In architecture there can be fantastic designers who do not have the commerciality and it is the same in farming. “It’s one thing being passionate about what you do but it’s another convincing others." Since their official launch in 2013 it has been a rapid journey of growth and at full capacity they now run 160 pigs and work with 300-400kg of meat a week. Operating as a closed herd, rare breeds are at the heart of the farm and comprise Tamworth, Oxford Sandy Black, Saddlebacks and Iron Age. Who needs toast soldiers when you can have Porcus Tod-lers instead! Nat says: “The rare breeds are more placid, grow for longer and as a result taste better. If you begin with a fabulous product then it’s half the battle. The sows average one-and-a-half litters, with piglets weaned at six to eight weeks depending on time of year, size and condition. The pigs are fed provin as their staple along with brewers’ grains and fruit. Pigs are kept outside with the option to venture into arcs which are bedded with straw. Fortunately, they are not blighted with any health issues, but numbers have decreased because of the wet weather. “The more pigs we have the more difficult it becomes to farm them. Our pigs roam outside 100 per cent of the time, so that’s the price we pay. “If you put them in a barn they will always be warm and dry and much easier to tend, but that’s at the compromise of their movement and overall health. “We don’t have to worry about slurry problems here but when you have had a difficult 18 months with the weather it becomes difficult to perform in it and becomes a quagmire," Nat? adds. In August 2017, the Mangalitza pig was introduced to the mix and will soon be ready to breed. “The Mangalitza pig is an import from Hungary which has firmly established itself on these shores as a replacement for the Lincolnshire Curly Coat pig, the last of which died out in 1972. “It’s an extremely hardy, slow-maturing pig – especially when compared to leaner, fast-maturing modern breeds – the Mangalitza will take up to two years to reach 100kg. In exceptional cases, it can weigh as much as 300kg, although this is not always desirable, takes several years and results in a fat carcase. "Even so, the slow-maturing nature and size of the Mangalitza means that when air-dried and cured it can produce very high-quality meat, similar to Parma ham. With a lack of forthcoming information about the breed, Nat took to social media and found The Mangalitza Man on Instagram. “There’s no competition between us and we share stories and information,” she says. Charcuterie production began in 2010 with the intention of offering consumers a plate of different varieties (see below), which has recently won a Q award. Customers include local farm shops, restaurants, food halls, Co-operative Food and more recently Morrisons. “We have been supplying Co-op since 2015. We were initially contacted by a retail consultant who were tasked by the Co-op to create a local section in their stores. “It’s a clever idea because they were selecting stores near where the produce is made. They looked at our capacity and how many stores were in the area. SJ admits they were not ready when they were initially approached by the retailer, but the baptism of fire pushed the business to a new scale. “They helped us understand bar coding and delivery schedules and help us get ready to supply somewhere bigger," she says. Of a similar ilk, Morrisons recently ran a campaign looking for smaller producers and Porcus impressed again and began supplying bacon and sausages into its stores this month. Looking forward, SJ and Nat have secured a private investor in order to help them increase their production capacity as they invest in a mobile butchering unit. “We had been in talks with quite a few different ‘moneymen’ but until recently none of them fitted our needs and criteria. We required someone dynamic, who would let us get on with our ideas. “We needed a person with great business sense who had made their own money and knew the challenges and pitfalls. It also had to be someone who genuinely cared about Porcus and the hard graft we’d already ploughed in and could see the potential. Not an easy find, but we got there. “We are currently working on a chiller room attached to the main house, the units will be arriving at the end of month. At 7.5 metres by 3.5m and 5.5m by 3.5m, there will be a dedicated unit for sausages and bacon and another for charcuterie. “We needed to jump higher to compete and for that we needed investment and we are excited about what the future holds for us."